Internationally renowned architecture firm Zaha Hadid Architects has created a new residential development for one of Mexico's largest cities. 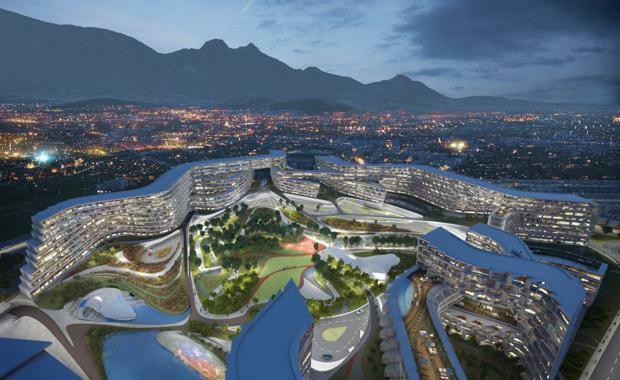 The firm, known for its futuristic, curving designs, has unveiled the plans for Esfera City Centre in Monterrey. The development will provide much-needed homes in a growing area of Mexico's third largest city. It's the London-based firm's first project in Mexico. Esfera City Centre will comprise 981 units built over a series of long-low-rise blocks. Apartments will range from 60sqm to 250sqm. A 30,000sqm public park will be located at the heart of the development and will feature a skate park, play areas, clubhouse, chapel, amphitheatre and picnic and relaxation areas. Esfera City Centre will also include two hotels: a five-star hotel with 4,500sqm in conference and meetings rooms; and a Business Class hotel for executives. There will also be 10,000sqm of office space available. The hotels and offices will be located within the shopping area of the developmentThe retail centre has been designed by architect Sordo Madaleno and will offer 80,000sqm of retail with anchor stores including Sears and Cinépolis, as well as restaurants and cafes. The first stage of the three-stage Esfera City Centre will include 353 units. It is scheduled for completion in 2018. Zaha Hadid Architects is an international architecture firm founded by Dame Zaha Hadid DBE. The firm designed the London Aquatics Centre, a 17,500-seat venue for the 2012 Summer Olympics; Guangzhou Opera House in China; the Bergisel Ski Jump in Innsbruck, Austria; and the Heydar Aliyev Cultural Centre in Baku, Azerbaijan.